Posted on March 29, 2019 by Sara K.
Here is our backyard. 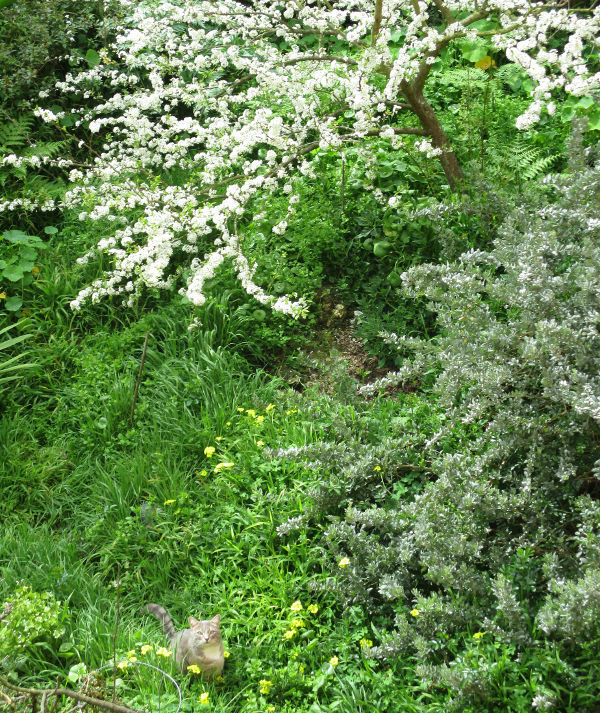 At the top you can see the plum tree in blossom, and at the bottom you can see one of our neighbors. Right now, the plum tree in our backyard is covered with hundreds of plum blossoms, but not for much longer. I always look forward to seeing the plum tree come into full blossom every year. It lasts, at most, two weeks. Posted on March 22, 2019 by Sara K.
While I was looking for videos for A Guide to Distinguishing Sinitic Languages by Ear, I discovered Shanghai Dream, a sitcom in Mandarin/English/Shanghainese/Russian about two European and two American young women in Shanghai. I got in the habit of watching an episode when I had a 15-minute block of time on the computer when I wanted to be distracted. By now, I’ve seen all twelve episodes. I’ve never been to Shanghai, but I’ve been a young American woman learning Mandarin and living in a Mandarin-speaking society, so I feel like I know at least a bit about the reality of this type of situation. And some things in this show feel very untrue. Such as the fact that these four women get to live rent-free in an upscale part of Shanghai?